Well, I guess I should be glad there's a third round to preview. After I said, "Celtic has no business being in Europe if they can't dispatch these guys handily," Celtic went to Gibraltar and...lost. Oh, boy. Well it was time for what this blog is (not actually) known for: on-the-scene (sort of) reporting. I was going to be in the UK for the return leg, so I planed to go...to a Celtic pub. The usual one was all the way across town, so I envisioned an epic walk across Bristol followed by watching the game among throngs of rabid Celtic supporters. By Wednesday, however, I was pretty tired, so I was very grateful to find out that the Celtic supporters were watching at a pub kinda near my hotel. Oh, and the sound wasn't going to be on because it was pub quiz night. Well, anyway, it was a place to have a pint of Guinness and watch with...I'm guessing three Celtic supporters. 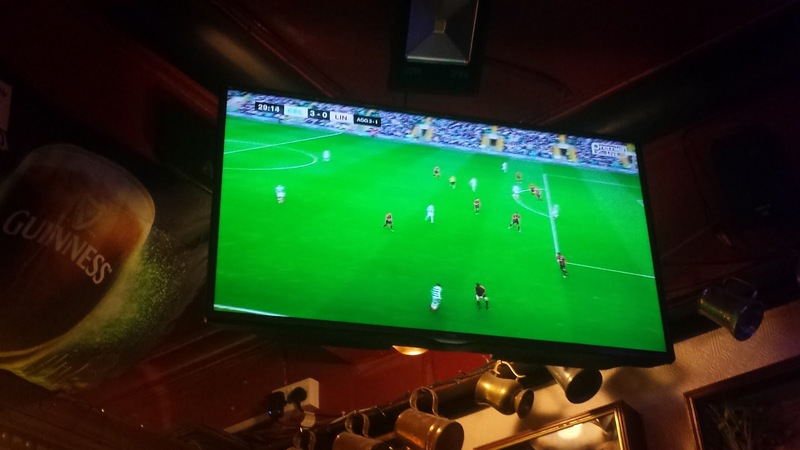 Celtic scored three goals in rapid succession to put things away, and I left before the pub quizzers showed up. The loss in Gibraltar, I'll remind, knocks 0.25 off the coefficient (compared to a win) for a five-year-period. For Hibs, I said, "I don't hold out much hope here, but it would be nice to see Hibs grab 0.125 or even 0.25, even if they don't advance." They almost advanced! They let in a goal in the first minute of the first leg, then held Brøndby scoreless for 209 minutes. And then lost in penalties. Sigh. I hate penalties. At least they got the 0.25. Of Hearts, I said, "I think everyone would expect two wins and 0.5 points." How about no wins and 0.125 points? Versus a team from Malta? Very embarassing. Finally, Aberdeen had looked rusty. "If Aberdeen can shake off some rust, they are certainly capable of a good result, but the full 0.5 points, or even advancement is not assured." Well, they got the full 0.5 points, and they're Scotland's sole Europa League representative (at least until Celtic gets knocked down from the Champions League). "I think a good outcome of the second round would be to see Scotland with 1.875 points or more for the year, with three out of four teams advancing. If two (or fewer) teams advance and Scotland only comes out of this with 1.5 points or fewer, things will not be looking up." So it's a split decision -- 1.875 points, but only two teams advancing. So Celtic is off to Kazakhstan to face Astana. Honestly, while they should win, it's going to be dicey. I included Kazakhstan in the chart above to show their position in the provisional 2017 rankings. A little below Scotland. If you stretch things out to the (very provisional) 2018 rankings, they're actually poised to pass Scotland. As for Astana, they were in the Champions League group stages last weekend, so a Celtic loss and dropping into the Europa League playoffs is a distinct possibility. Aberdeen faces Maribor of Slovenia. Slovenia is a couple of notches below Kazakhastan. However, two years ago Maribor knocked out Celtic on their way to the Champions League group stages. It's not going to be easy for Aberdeen, but they've got an experienced squad. A good outcome would have both teams alive, with Celtic still in the Champions League. Honestly, if that happens, the minimum points (2.375) would be acceptable. If it doesn't, you'd like to see Aberdeen add to the coefficient on its way out, with Celtic's main contribution likely to be in the group stages of whichever competition they are in at that point. First of all, my plan all along was that Celtic needs to stay Celtic (or Rangers, but we'll address that next year maybe) and pick up on the order of 12 points (3 after adjustment for the coefficient). They're at 1, which is not great, but most importantly they are alive. The other teams need to provide 8 or 9 parts. Aberdeen has 3, so they've done their share and are poised to pick up more. Hearts got 2.5 before exiting, which is close to their share. Hibs, however, exited with 1, which is typical for Scotland, and frankly more than you'd expect for a lower-division team. So 6.5 so far. If Aberdeen can advance, there's every reason the non-Celtic teams can hold up their end of the bargain for the year.